The seventh episode in the second series of The Borgias finally delivers the infamous bonfire of the vanities, a spectacle promised since Savonarola was introduced in the first series. Juan Borgia returns from Spain, and is quickly set to the task of bringing Caterina Sforza to Rome. Since Savonarola's first appearance in series one, viewers have wondered what the writers would do with the incident known as the "bonfire of the vanities" - so called because Savonarola's adolescent mob, the fanciulli were reported to travel the city gathering objects such as vanities (hand mirrors) to put into a bonfire to physically and symbolically expunge Florence's sins. In the episode, Savonarola's fanciulli roam the streets, singing hymns and harassing households for objects to throw into the fire. Machiavelli, with Cesare looking on is confronted by the youths, and amusingly relinquishes a stuffed owl to get the youngsters away from his door. Later, he and Cesare watch with concern as Botticelli makes his way towards the bonfire to throw in a painting that appears to be a pastiche resembling La Primavera. Cesare and Machiavelli watching Botticelli lead his painting to the fire. Inset widely believed to be a self-portrait, Botticelli in an Adoration scene for the Medici. Accounts of Savonarola's sermons against impious depictions of the Virgin and the saints. Savonarola was not entirely against images, but did seem to take offence at depictions of holy figures that were too infused with aesthetic consideration. For a wonderful account of this, and artists' response to Savonarola, Marcia B. Hall's The Sacred Image in the Age of Art is thoroughly recommended. Hence, despite not being documented at the time, and not even by Vasari writing over 50 years later, we still somehow end up with the idea that Botticelli was so swayed by Savonarola that he threw his paintings into the fire. The development of this particular myth of the Renaissance is likely linked to its representation in popular culture, from literature to TV - which this episode of The Borgias has astutely perpetuated for the current generation of viewers. Perhaps one day a lucky archivist will stumble on a document that can clarify this without question, but for now the closest we have are interpretations of Botticelli's paintings that seem to suggest the influence of Savonarola's sermons, such as the Mystic Nativity - though it should be mentioned even this reading is not universally accepted. 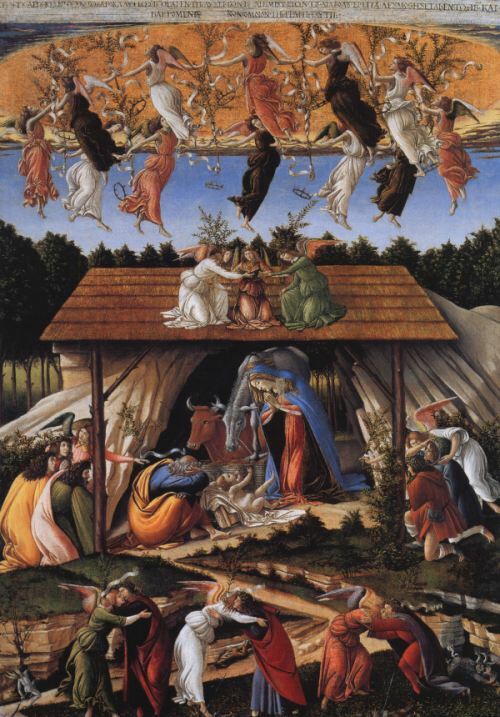 (see Hatfield in refs, and 3PPs post on the Mystic Nativity). Overall, this scene is quite fascinating - even beyond the curiosity of Botticelli throwing his mock-Primavera into the fire. Savonarola ominously taunts Machiavelli that his books will be next, and Micheletto seems to have joined Savonarola's followers. Whether this is out of guilt for being an assassin and/or his love for Augustino, or some other reason is unknown - there is very little said to make Micheletto's intentions clear during his appearances at the church and the bonfire scene. Another curiosity in this scene is the equestrian statue seen in the background of the throng making their way towards the bonfire. The statue strongly resembles the monument made to Cosimo I dei Medici by Giambologna, some 100 years later. Juan Borgia is back from Spain, venereal disease in tow. With Cesare watching Botticellis burn in Florence, the potentially violent re-union the brothers will have is postponed and Juan is sent to bring Caterina Sforza to Rome to answer for her defiance. She refuses, and in an underhanded move, her son is kidnapped by Juan, and soon tortured. Caterina's actual defiance against the papal forces was celebrated for generations - with accounts describing her nobility and courage. There is something of this in Gina McKee's portrayal, though it can easily be argued the writers took their penchant for historical legends a little too far when they showed an armoured Caterina proudly brandishing her privates to the papal forces, reminding them that she has the necessary anatomy to make more sons. Fortunately for everyone watching Caterina's display of bravery, the whole fiasco comes to an end when Ludovico Sforza's army turns up and Juan Borgia is injured and forced to flee. From the historical record, we do have an account of different confrontations at Forli, where Caterina acted in a noble and brave manner, the most notable perhaps being against the Orsi and also against Cesare Borgia in 1499. In the episode at least, this bungled siege has been put in by the writers to further pave the way for Cesare to eventually take control of the papal armies. Those curious about the historical accuracy of Caterina's display should be aware that the most popular account stems from Machiavelli, giving an account of when Forli was besieged by the Orsi. First described in his Discourses on Livy, and then in History of Florence, Machiavelli's tale of an emboldened Caterina mythologises the woman beyond what the historical record permits. The two accounts are slightly different, with Caterina becoming increasingly bolder and boastful in the latter, claiming she has the means to make more children. Count Pietro Desiderio dall'Onda, who compiled the most well-known biography of Caterina, relates this event, known as leggenda della rocca (legend of the fort) as being a folk tale distorted and mythologised by writers, particularly Machiavelli and Lodovico Guicciardini. E non vi pare egli, stolti, ch'io abbia le forme da farne degl' altri? You fools, don’t you see that I have what it takes (forme: "the moulds") to make more of them? For more on Machiavelli's motives, and the classical sources he likely drew upon when distorting Caterina's legendary story, see Viroli and Shugaar (2010) in references. Caterina Sforza boldly defies Juan. Inset This figure in Botticelli's Primavera is claimed by some authors to be a depiction of Caterina. Lucrezia is still being courted by Calvino Pallavicini of Genoa, but ultimately rejects his offer of marriage. Alphonso of Aragon's name is mentioned, steering us back towards the historical truth of Lucrezia's future husband. Until Alphonso arrives though, Lucrezia takes to flirting with Calvino's brother - Raffaello Pallavicini, a noble youth who passes his time by drawing the ruins of Rome. It has been numerously reported that there were many artists named Raffaello (Raphael), even beyond the most famous of them all, Raffaello Sanzio of Urbino, who is still over a decade away from his first documented appearance in Rome (taking the show's timeframe as c.1495-7) . Things can only go downhill for Savonarola after the bonfire of the vanities. Alphonso of Aragon must surely appear soon to woo and wed Lucrezia, and Juan Borgia is likely to meet a masked figure intent on killing him. Many thanks to Dr. Edward Goldberg from Italy's Secret Places for the translations of Vasari's account, the Zaccaria entry on Simone Filipepi, and the Caterina Sforza quote, plus extended annotation on Lodovico Guicciardini and the complexities of stating a publication date for L'Hore di ricreatione. Excerpt from entry for Lodovico Guicciardi from the Italian Dictionary of National Biography. source Translated by Dr. Edward Goldberg. In 1565 there also appeared in Venice, under the auspices of two different publishers, D. Nicolini e G. Cavalli, The Sayings and Deeds, Both Pleasing and Grave, of Various Princes, Philosophers and Courtiers, Collected by Guicciardini and Presented as Moral Lessons. The Hours belong to the genre of pleasantries (facezie) and memorable sayings, which returned to prominence in the Fifteenth and Sixteenth Centuries and was widely practised in the in the Low Countries as well… Contrary to the licentious character of the anecdotes, emphasized in the past by critics who followed the guidelines of Tiraboschi, but in fact limited to only a very few examples in a total of 700 little stories in the final edition, the actual intention of The Hours is to be sought in the archetypal or moralizing explanation in the title-rubric of each story. Weinstein, D. Savonarola: The Rise and Fall of a Renaissance Prophet. Yale Univeristy Press. 2011. Vasari, G. Milanesi, G (ed.). Le vite de' più eccellenti pittori, scultori ed architettori. GC Sansoni. Florence. 1906. pp.317-318. Excerpt translated by Dr. Edward Goldberg. Mise in stampa ancora molte cose sue di disegni ch’egli aveva fatti, ma in cattiva maniera, perché l’intaglio era mal fatto: onde il meglio che si vegga di sua mano è il trionfo della fede di Fra Girolamo Savonarola da Ferrara; della setta del quale fu in guisa partigiano, che ciò fu causa che egli, abandonando il dipignere, e non avendo entrate da vivere, precipitò in disordine grandissimo. Perciocché essendo ostinato a quella parte, e facendo come si chiamavano allora, il piagnone, si diviò dal lavorare: onde in ultimo si trovò vecchio e povero di sorte, che se Lorenzo de’ Medici mentre visse; per lo quale, oltre a molte altre cose, aveva assai lavorato allo Spedaletto in quel di Volterra; non l’avesse sovvenuto, e poi gli amici e molti uomini da bene stati affezionati alla sua virtù, si sarebbe quasi morte di fame. Violi, L. Le Giornate [sec. XVI], Garfagnini GC (ed.). Florence. 1986. Cited by Zaccaria. Translation provided by Dr. Edward Goldberg. Savonarola's bonfire was something to behold - and I was so horrified to see the Botticelli burning that I didn't even notice it was the artist himself who had thrown it in! Thanks for a very nice job on Savonarola and Botticelli. Savonarola objected to depictions of the Madonna in regal robes and claimed that artists should depict the actual humble status of the Holy Family. What books could Machiavelli have written by 1495? I've added a clarification on the "Legend of the Fort" and the infamous display ascribed to Caterina Sforza - it seems many want to know if this happened and who was responsible for the distortion. We do not know for certain what was on the Bonfire of the Vanities but we assume that many objects of beauty were lost. It is not likely that Italian artists would put their own masterpieces on the fire: but that does not mean that patrons did not place their own copies on the bonfires. I was alarmed to hear that books were also being demanded as these were rare and Savanlarola was well educated. However, may-be some works were considered wicked or heretical and should have been considered worthy to be burnt in his eyes. I was fascinated to see Caterina Sforza standing up to Juan even when her son was being used against her and her famous legend of her stating she has the means to produce more sons if he was killed was a lively part of the same episode. What a contrast. She will of course, be captured not by the coward Juan, but by Ceasere, as papal general after his brother's death. A great episode: vivid and provoking.